Maybe Obama had a deal 'on the T-Tip of his tongue' .. There is no doubt that Barack Obama is the coolest president ever. That is why him trashing the idea of Brexit has infuriated the right-wing Leave campaign. It was recently revealed that the US government is discussing how to make a direct intervention in the EU referendum debate. Don't give money to Ukip and Tory EU campaigners! The establishment media has already decided that reactionary pro-austerity politicians are the only exit voices they will feature. 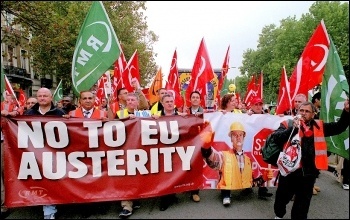 They completely ignore the millions of trade unionists and young people who, like the Trade Unionist and Socialist Coalition, oppose the EU from a completely different standpoint.